With its fabulous food, edgy culture and seaside location, Naples is becoming an increasingly popular city break destination. Where once tourists simply passed through en route to the Amalfi Coast, today more and more are stopping off for a few days to explore Naples’ narrow alleyways, enjoy some of the world’s finest pizza, and take in a few of the historic sights. It’s a chance for visitors to escape the rat race for a few days, all thoughts of work stresses or the daily grind put aside. And I’m fairly certain most of them don’t want to think about death either. But in Naples, death is everywhere. The city is one of the oldest in a predominately Catholic country, and with its history stretching back over centuries, it’s hardly surprising that the place is crammed with churches and burial grounds and art that not only commemorates the people who have gone before, but also reminds those left behind that they need to behave, lest they be judged harshly in the afterlife. 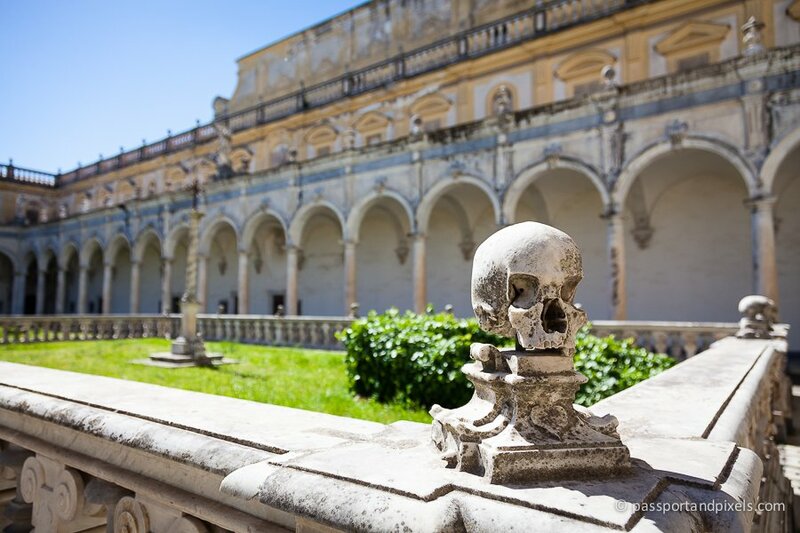 So while it might not be cheery, avoiding the topic of death in Naples would mean missing out on some of its richest history and heritage. 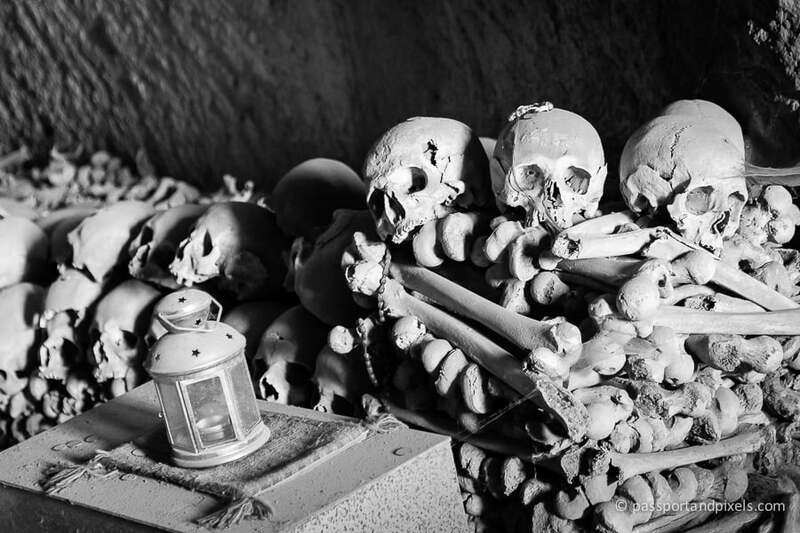 Never one to shy away from a less-than-happy subject, I visited two of Naples’ most important historic burial grounds: the haunting Catacombs of San Gennaro and the macabre Cimitero delle Fontanelle (about which more in a moment). 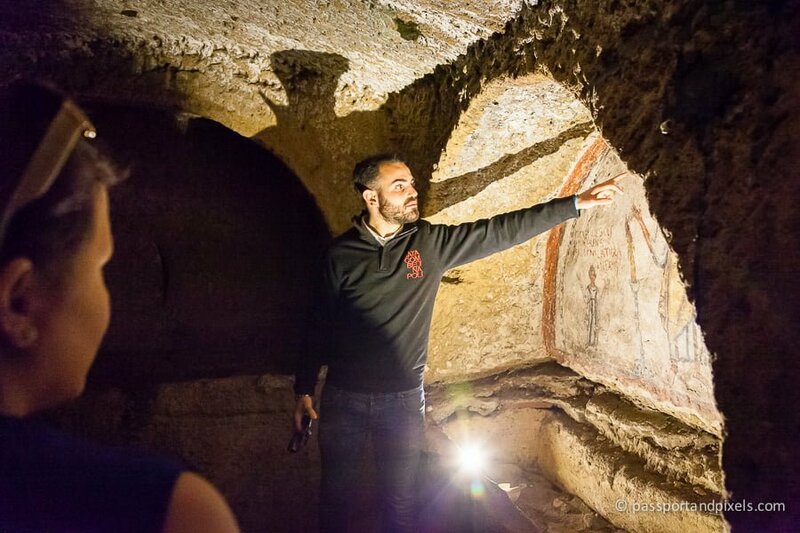 The Catacombs of San Gennaro are located in one of the most deprived areas of the city – the district of La Sanità. 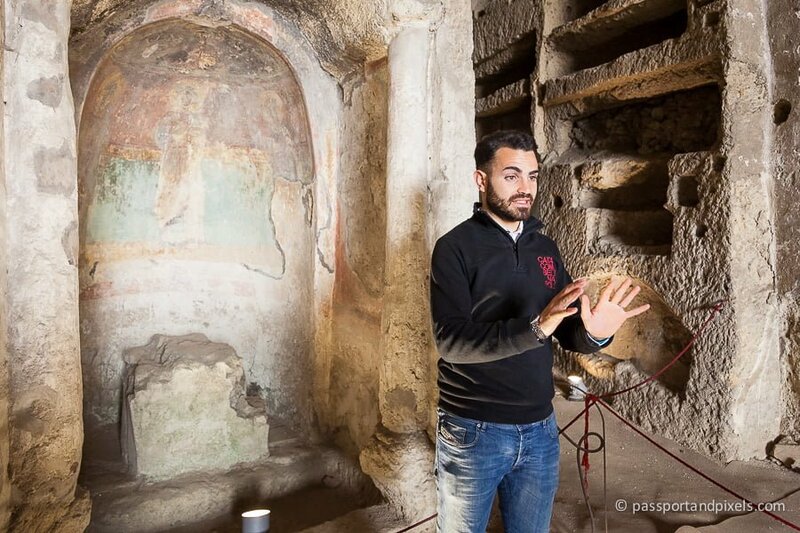 It’s not an area most tourists usually venture to, but it’s worth the short bus ride to discover this haunting underground maze of tombs and frescoes that’s vastly different from anything else you’ll see in the city. 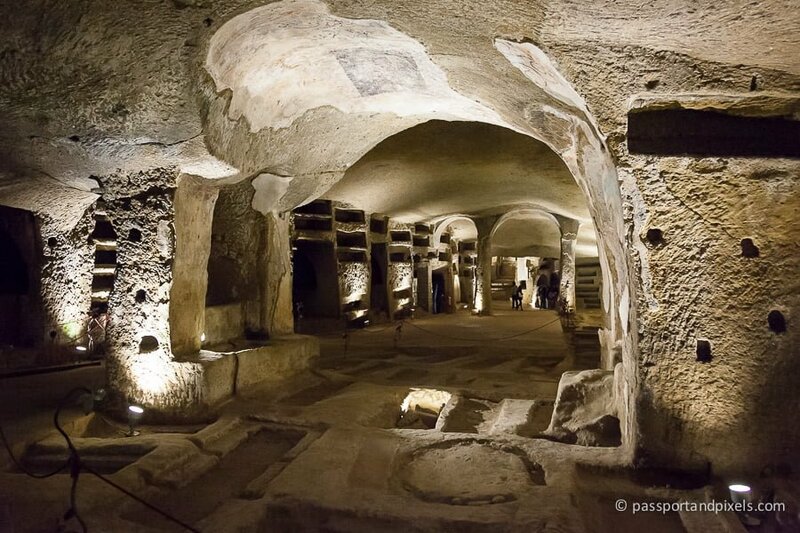 These catacombs are ancient – dating back to around the 2nd century AD. They get their name from Saint Gennaro, the patron saint of Naples, who is said to have been buried here in the 5th century. The enormous burial chamber is split over two levels, with grave sites clearly visible in the walls and floor. Rich families had their own chambers, while the smaller graves were occupied by poorer people. 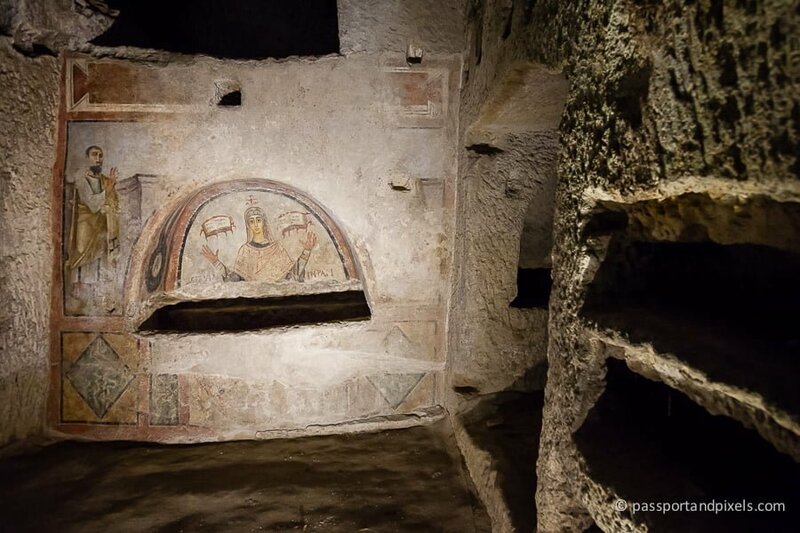 Many of the graves are decorated with stunning frescoes illustrating either a religious scene, or the life of the person buried there. 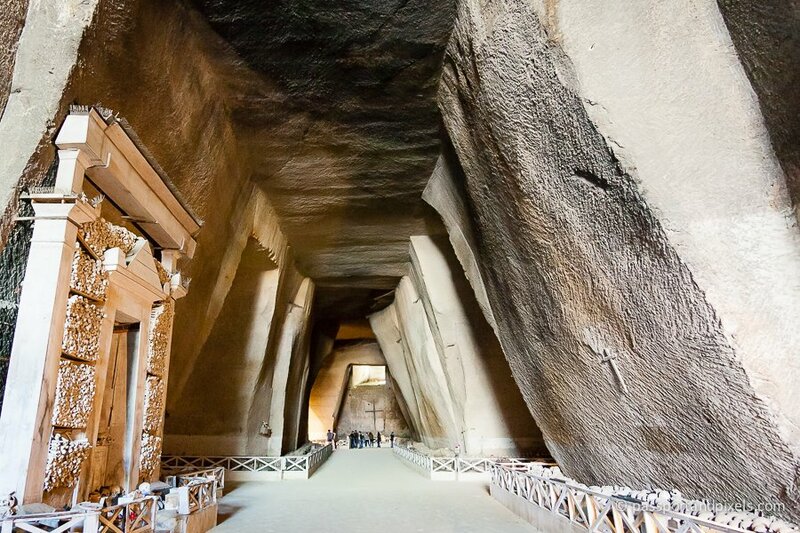 Some of this artwork is over 1500 years old and still incredibly well-preserved, thanks to its dark underground location. It’s incredibly atmospheric. Even though all the bodies have now been removed, you really feel the weight of the ages pressing down on you, the footsteps of the thousands of people who’ve passed through almost – but not quite – echoing through the chambers. It’s the sort of place that might make you start to believe in ghosts. I particularly loved this burial plot, which houses a mother, father, and daughter. I was struck by the small size of the grave – how on earth did they fit three people in there? But although it’s quite narrow it’s because it’s also deep, and with limited space in the catacombs bodies were often stacked up several to each hole. So this grave would have had all three members of the family piled up one on top of the other. But not all at once. From studying the fresco, archaeologists can tell that the parents and child did not die at the same time. There are actually three layers of paint on the wall, revealing that each time someone died, the grave was re-opened, the newest occupant interred, and the painting redone with that person added in. The catacombs are run by a co-operative of local volunteers who wanted to do something to improve their area and draw tourists in. They’ve worked with the community to properly excavate the site and transform it from a semi-abandoned hole in the ground into a well-managed and fascinating historic attraction. 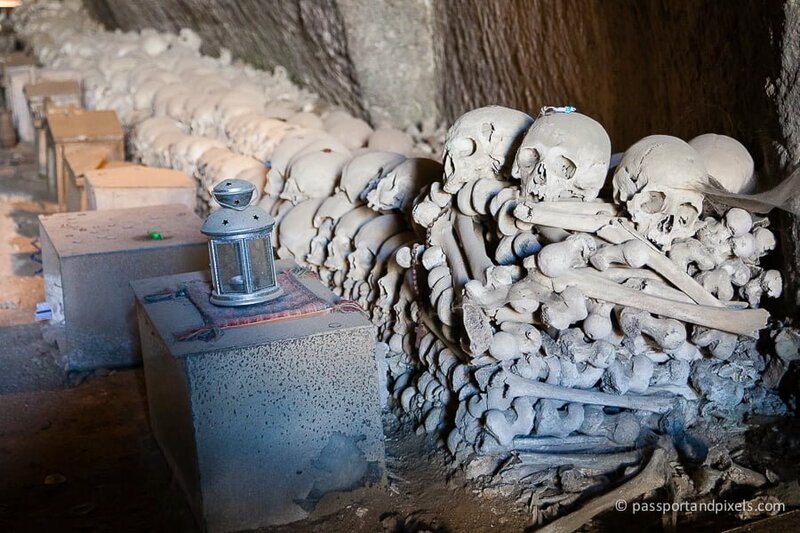 But you can’t visit the Catacombs of San Gennaro without wondering where all the bodies have gone. And if you want to see them, you don’t have to go far. 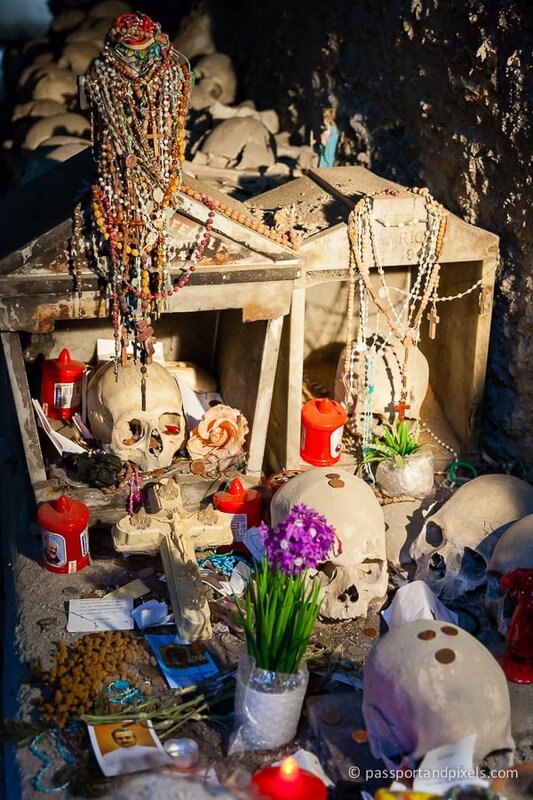 Just a short walk from the Catacombs of San Gennaro is the macabre Cimitero delle Fontanelle. Although it’s called a ‘cemetery’, it’s not like any I’ve ever seen. There are no neat graves, no grassy walkways, no ornate tombstones, no lofty cypresses. Instead, this cavernous former quarry is simply stacked to the rafters with jumbled piles of bones. 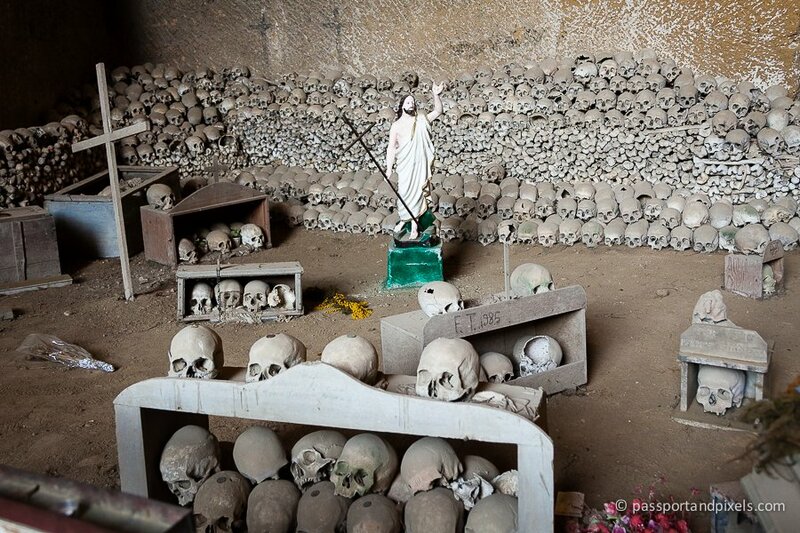 Literally tens of thousands of skulls and bones from throughout Naples’ history are stacked up here. 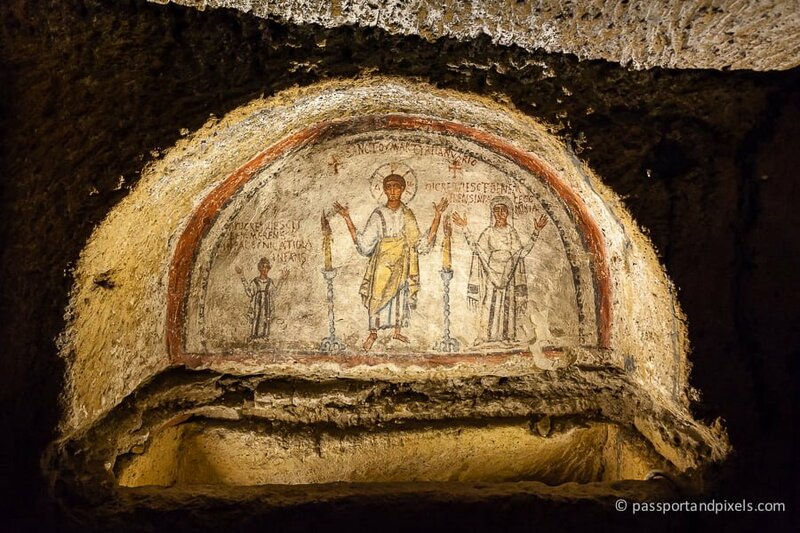 Not just from the catacombs, but from churches and other burial chambers right across the city. They seem to be in no particular order: just dumped in piles, though they mostly appear to be only leg bones and skulls. It’s not clear where the smaller bones have gone. The site was first used as a burial ground in the 16th century. 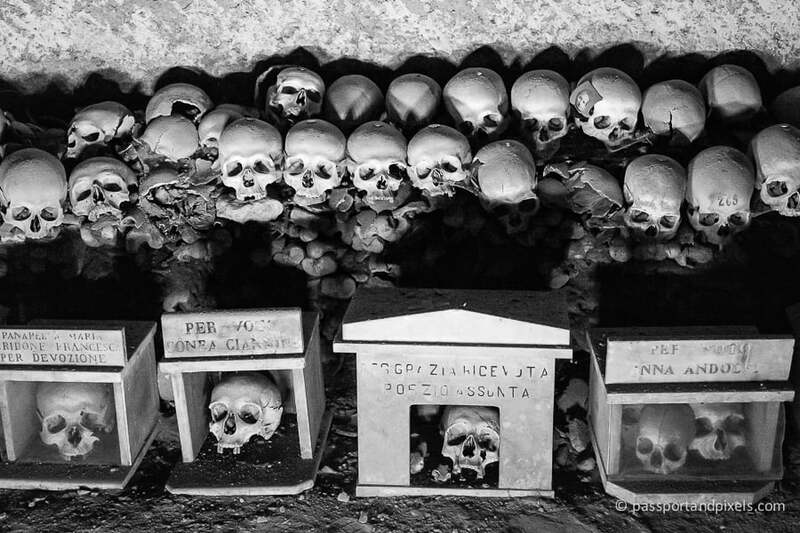 Back then, Naples’s churches were running out of room to bury their dead. 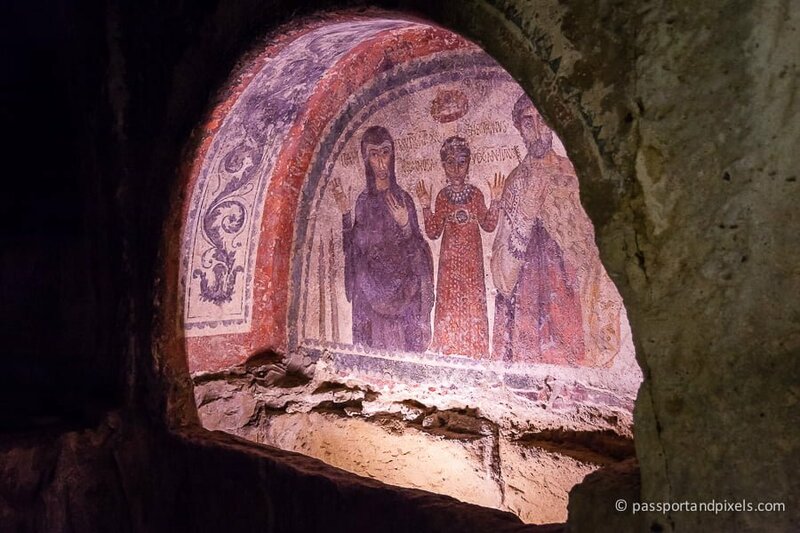 To make space for the newly-deceased, the churches began removing older remains to this cave outside the city walls. 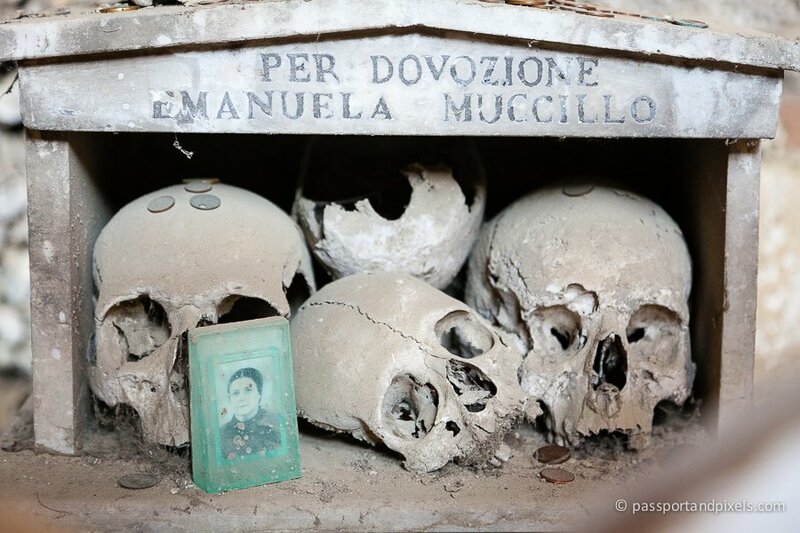 More and more bodies were added, and the Cimitero delle Fontanelle began also to be used as a mass grave for the poor, who could not afford to be buried in church. Many of the remains here are from the plague of 1656 and a cholera epidemic in 1837. As numbers continued to pour in, the site became chaotic. At one point a flood washed many of the remains out into the street. So in 1872 all the bodies were disinterred and catalogued, before being piled up again as they are now. With the 40,000-odd remains now clearly accessible to anyone who wanted to walk in, a ‘cult of the dead’ sprang up in the late 19th century. Devotees paid visits to the skulls, prayed for them, and brought them offerings. Some even ‘adopted’ a skull, placing it in a mini shrine and giving it a name. People would bring gifts and money in the hope that the dead person would return the favour by bringing them good fortune. The practice hit its height during World War II, when grieving families would ‘adopt’ a skull in memory of a loved one missing or killed in action. 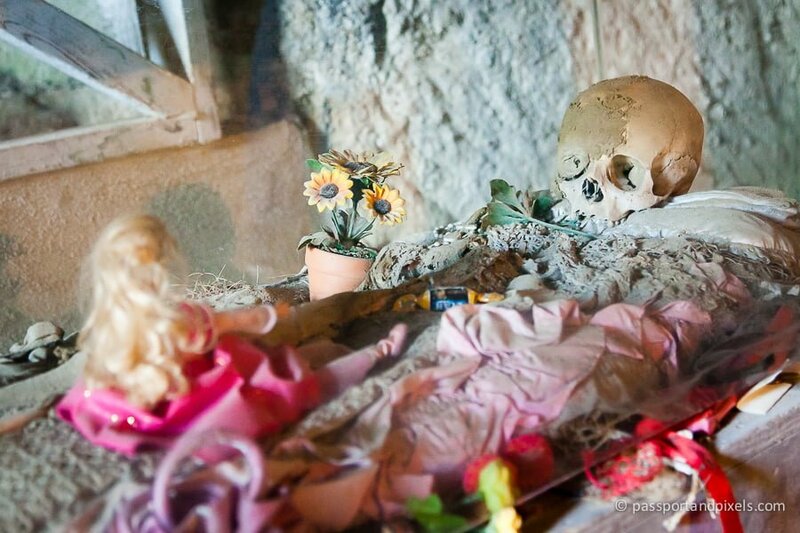 Gifts of flowers, sweets, and a doll have been left for this set of remains, presumably a little girl. The cult was eventually shut down in 1969, when the Catholic Church decided it had degenerated into idolatry. But from some of the newer-looking offerings, it looks as though the practice still continues. 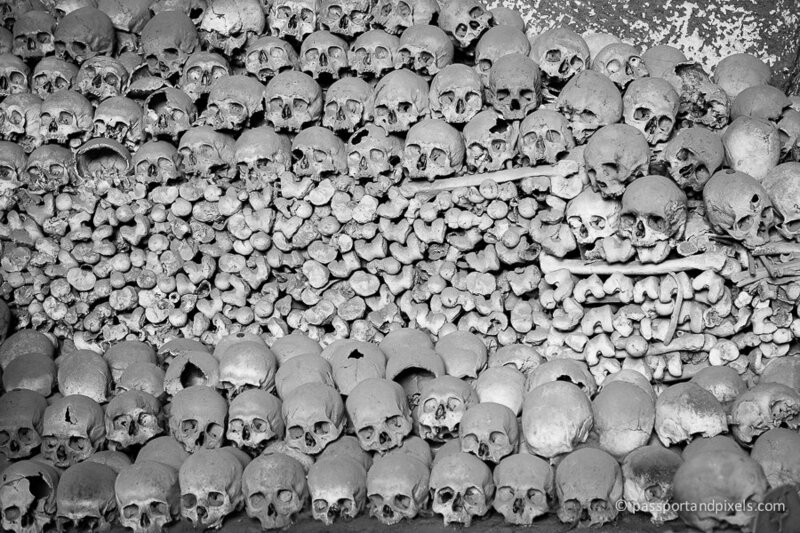 Walking around amongst these enormous piles of skulls and bones is a deeply haunting experience – and once which I found sad and disturbing. So many lives lost, so many unknown people. Each of these skulls was once a human being – living, breathing, noisy, real – just like you or me. We’re not used to seeing dead bodies – we bury them away or cremate them – so to come face to face with them in such huge quantities is a macabre experience. You realise that you too are just skin and bones, and will one day end up like this. 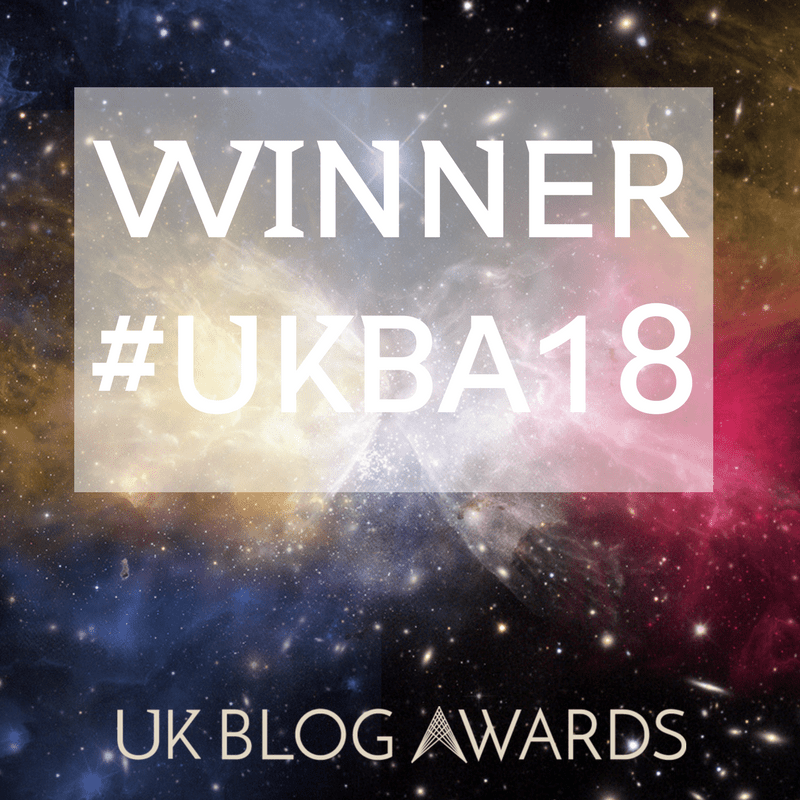 I know it’s not normal to get all depressing in a travel blog, so I do apologise if this is not what you were expecting when you started reading this post. But that’s how I felt when I was there – and sometimes it can be good to face up to this stuff. It makes you realise that life is short, and you must live it to the fullest. Which of course is a great attitude to have when you’re on holiday. 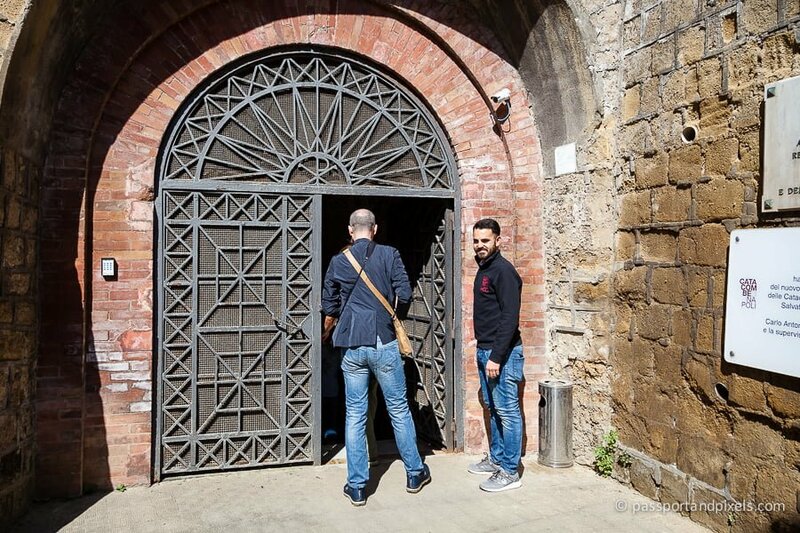 After you’ve been to the Cimitero delle Fontanelle I guarantee you’ll be up for making the most of the rest of your day with a large glass of wine and a delicious Neapolitan pizza!